The patent pending Floor Washer System is the Foambuster nozzle/deflector, but with the deflector rotated from below the nozzle to above the nozzle. 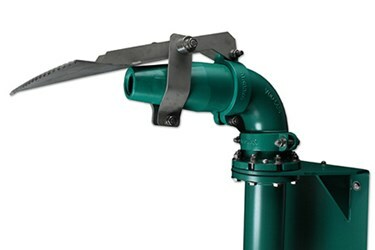 The inverted splashplate spreads nozzle flow out across a floor in a fairly wide path to wash settled grit, sand or debris into a sump where it can be pumped out by a dewatering chopper pump. The Floor Washer System is particularly useful for attacking deposition problems in Combined Sewer Overflow (CSO) tanks, storm collection tanks, equalization tanks, lift stations, and influent channels.